As the weather begins to warm, parks and public playgrounds become crowded with eager kids ready to let loose from being indoors. But with the warmer weather and playing outside also comes safety issues. More than ever, moms want peace of mind. Peace of mind that their child made it to a friend’s house in the neighborhood or to the local park safely. The Insignia Little Buddy Child Tracker helps provide that peace of mind. Give your child the freedom to explore while still maintaining peace of mind with the new Insignia Little Buddy Child Tracker system. The device enables you to access your child's location 24/7 via your computer or smartphone. The Little Buddy transmitter uses GPS and cellular technology to provide real time location updates. It fits effort less into any lunchbox or backpack, making it easy for you child to carry while on the go. Set parameters and check-ins while still building trust and granting additional privileges. A variety of service options ranging from a flat monthly rate to per-search fee, allow you to choose the plan that fits your family's needs. Of course nothing replaces talking to your child about their safety. That’s why the Insignia Little Buddy Tracker is not recommended to replace those discussions, but rather to provide extra protection and peace of mind – because you can’t be physically attached to your child 24/7. - Low battery - a text message will alert you when the battery on your device is low. - Safety checks - you can setup areas and times where your child is supposed to be ( like "at school" or in " the neighborhood") and if they leave the area you get a text message. - 30 day free trial with unlimited usage. WIN: 24/7 MOMS and Insignia are giving away on Little Buddy. US entries only and one entry per person. Winner will be chosen on May 16, 2010. *We received a complimentary Insignia Little Buddy Child Tracker for review no financial compensation was received. You can also shop Online use code ONBIG30 at checkout to get 30% off your entire order. - Place one letter on each page either draw it or glee a cut out. Keep the letters in alphabet order. - Have the child draw or wrote bout his mom or grandmother on each page to go with the letter of the page. Such as " A" - A stands for my Amazing MOM. Here's a quick and easy card you can make for Mother's Day. All you need to do is roll out a circle of paper clay ( sold at Michaels and Daiso). Push the child's hand in the clay. Let the hand print dry for a day. When dry, glue it to your choice of card stock. This would also look cute framed in a shadow box. *Paper clay is very light so it won't way down the card at all. You can also paint paper clay. Is it a card? Is it a gift? It's both! This easy-to-make card lets little ones display a seed package of pretty spring flowers that you can plant together. Green cardstock cut to 5 ½" x 8 1/2"
White cardstock cut to 5 1/4" x 3 ¾"
Fold green cardstock in half. Glue white cardstock to front of green cardstock. Use the craft scissors to snip two corners from the yellow envelope and two corners from the orange envelope. The corners should be between 1" and 1 ½". Fit the envelope corners onto the corners of the seed package. With the seed package still in the corners, glue the envelope corners to the white cardstock. Tie the ribbon around the spine of the card. Write, stamp or glue your Mother's Day greeting inside. Instead of a seed package, you can use a gift card, special photo or individually wrapped packed of mom's favorite tea. If the price is displayed on the front of the seed package, place a small sticker over it. Choose paper colors that complement the seed package colors. By: Amanda Formaroon at the Kaboose site. There’s nothing more unique than a fingerprint and nothing more special than preserving a child’s tiny fingers and hands for posterity. Mom will love and cherish these adorable cards made by little hands. For smaller cards, cut construction paper in half. For larger cards, leave as is. Fold construction paper in half to create a card. Use acrylic craft paints to paint a child’s pointing finger. Use this for the center dot of each flower. We used pink, blue and purple for our centers. Use a small paint brush to add the stem, then use child’s thumb to create the leaves. To make the heart card, begin by very lightly drawing a simple heart onto the construction paper. Next, squirt out some paint onto newspaper or paper plate. Have child dip the tips of their fingers into the paint and press onto construction paper following the heart shape. Use a contrasting color to fill in the heart. Use crayon or marker to write “Happy Mother’s Day” on the card. For the “love” card, have child hold their right hand in the shape of an “L”. Be sure it is their right hand and not the left. Paint the “L” shape portion of their hand and help them to press it onto the paper. Have the child make an “O” shape with their hand, paint it, then press to the paper. Paint the child’s pointing and middle finger for the “V” and press onto the paper. Using the child’s pointing finger, paint then press to the paper for the long side of the “E”. Paint the top part of their pointing finger to add the horizontal lines of the “E”. Use a crayon or marker to write “Mom is” above the word “Love”. Have a damp washcloth handy to wipe off excess paint from child’s hands when changing colors. When finished with this project, have child wash hands with soap and water. Get creative and use whatever colors you like. Just remember to use colors that contrast with your construction paper to be sure it shows up well. You may want to have the child write their personal message inside the card before starting the paint process. It can be done afterward, but if done before there’s no risk of accidentally messing up these cute creations. The charming eight year-old Tyler Doherty (Tanner Maguire) is diagnosed with a rare terminal brain tumor. He lives with his mother, Maddy Doherty (Robyn Lively), his teenage brother, Ben (Michael Christopher Bolten) and his grandmother, Olivia (Maree Cheatham). He has just returned home from a long hospital stay and looks forward to hanging with his vivacious next door neighbor, Samatha Perryfield (Bailee Madison), as well as the chance to go back to school. Tyler looks different with a shaved head and lots of scares which could be cause for ridicule; but, he is anxious to return to a normal life. In order to cope with his own physical suffering and the sudden loss of his father, Tyler begins to write letters to God and daily drops them in the mailbox. His stamped mail falls into the hands of the neighborhoods substitute mail carrier, Brady McDaniels (Jeffrey S.S. Johnson). McDaniels initially scoffs at the sight of Tyler’s outgoing post until his boss gives him the task of caring for the letters and is annoyed with his new responsibility; but, he doesn’t have the heart to toss the correspondence and simply collects them. In the course of a few weeks McDaniels comes to know Tyler, his family and the close-knit neighborhood which is a needed balance from his despicable life. He observes that the reality of Tyler’s grim prognosis doesn’t keep him from being a delightful, fun-loving kid as he reaches out to give hope and love to others, putting their needs above his own to truly become a brave warrior, coined by Samatha’s grandfather, Cornelius Perryfield (Ralph Waite). Letters to God is based on a true story from Patrick Doughtie on the life of his son Tyler who was an inspiration to the people his short-lived life touched while on this earth. A command performance by the whole cast and crew. It is definitely a film not to be missed and is much more than entertainment. 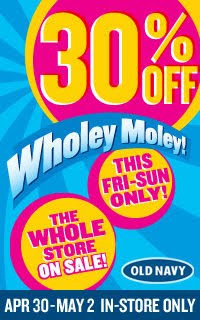 Save money when you SHOP the 24/7 MOMS Coupon site , you will find over 5000 coupons from over 1250 stores. Babies R Us - Buy 2, Get the 3rd Free on ALL Gerber organic cloth diaper 6-pks. Q: If you had $5.00 to spend to day what would you spend it on? Q: What is more useful when it is broken? Lights Camera Action Thanks - Create a Movie Time gift with the 24/7 MOMS pop corn wrapper. Add a movie gift card and your gift will be well viewed. Click here to download and print your FREE pop corn wrappers. This Book Belongs to- Personalize the 24/7 MOMS Teacher bookplates for each of your Children's Teachers. Add either kids age appropriate books for their class room or one for the teacher to read to complete your gift. Click here to personalize and download your FREE Teacher book plates for female Teachers. Click here to personalize and download your FREE Teacher book plates for Male Teachers. 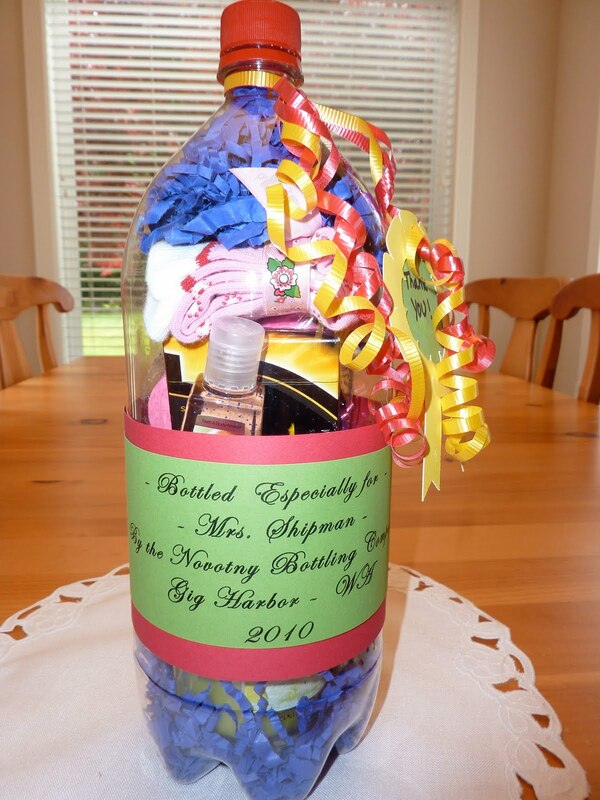 Pop Bottle Fun - This fun gift always gets the question "How did you get the items in the bottle?" Simple. various small gifts from lotions , gum, gift cards etc. cut out shape such as medal, apple, school bus etc. Once it is filled with your gifts you will cover it with the new label you make with the colored paper. I printed the label from my computer using fancy fonts. Then cut it to size to wrap around the bottle covering the door (hole) I made. 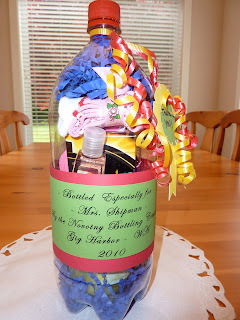 Once all is sealed and labeled you can tie curling ribbon and your cut out tag to the bottle. I wrote Thank you in the cut-out tag. By the Novotny Bottling Co.
Summer Fun Kit - Who doesn't love a new beach towel to kick off summer with. Pick-up a few wimple items at your local variety store to create a fun Teacher summer kit. Beach towel, magazine, sunscreen, candy treat. Place the folded towel on top of the magazine. Place candy in a clear cellophane bag and tie with curling ribbon. using curling ribbon tie all 4 items together then take a 2 inch think matching ribbon and wrap around the items then tie into a bow. Meal in a Bag- Add a little fun to a special breakfast treat or lunch that you deliver to your Child's teacher with this colorful idea. 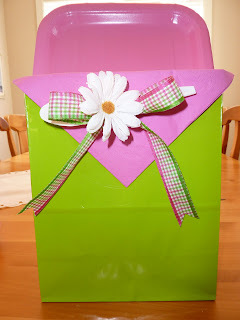 Obtain a small gift bag, coordinating, silverware, plate and matching ribbon. Fold the napkin over the bag and punch holes so you can they attach with the ribbon. Tie the silverware on with the ribbon. Next add in the food and beverage items for the teacher meal then top of with a matching plate as seen in the picture. Treats for Teachers - Sweets given in a simple personalized container are fun to give. 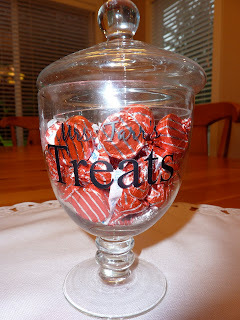 Add vinyl or rub on letters that you can purchase at craft stores and place on a candy jar or container. 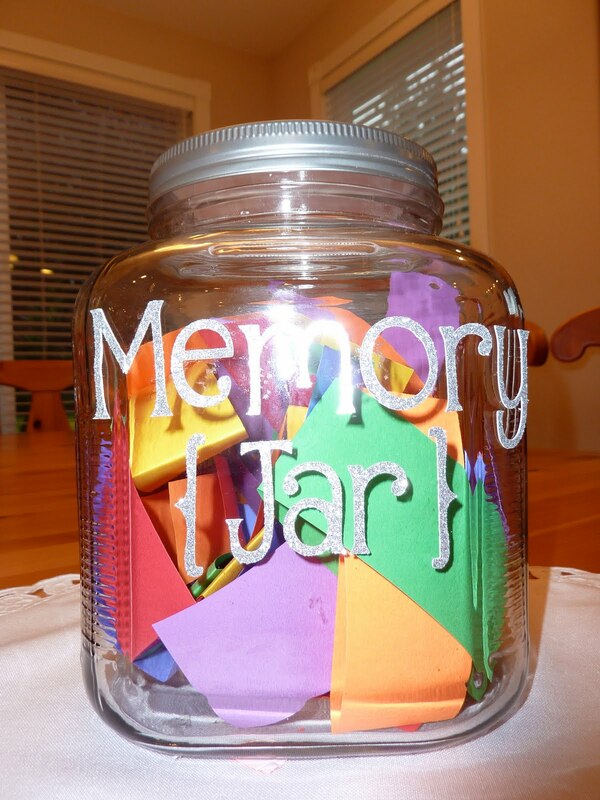 Such as " Mrs. Smiths Treats"
Memory Jar - This makes a fun class project for children to give to their teacher. Purchase a large jar with lid, add letters to it using stickers, cut-outs or rub on's. Then cut stripe of colorful paper to then give to the children in the class to write their favorite memory of their teacher or why they like their teacher. 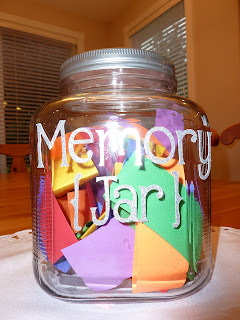 then place them in the jar to give as a class appreciation gift. Tamraak is Indian-inspired children's clothing for chic little girls. Styles are modern, fabrics are traditional Indian — colorful luscious silks, the softest cottons. It's so much fun to dress little girls! The founder of Tamraak enjoys spoiling her nieces with beautiful clothes but had a hard time finding outfits with the ethnic flair she loved. Tamraak blends modern and traditional, to create these unique styles for your little girls. Tamraak sizes are for girls 4-8 years old. Tegh, Armaan, Maya, Riya, Arjun and Kirin. One of the popular items from Tamraak is The Riya top is just like the little girl it's named after... so cute that you want to pinch its cheeks, but then it has an edge to it that is indescribable. This top is perfect with the Riley skirt from the Tamraak collection for a dressy look or with jeans or capri pants. Fully lined, with a button closure on the back for a comfortable fit. Designed and handmade in India, of silk and cotton. Colors available: Pink and Soft Green. US entries only and one entry per person. Winner will be chosen on May 9, 2010. *We received a complimentary Tamraak Shir for review no financial compensation was received. Go to CouponCabin.com. Search for “Magazines.com”. They’ll give you a $5 off link. Choose from a wide array of titles. Try MagazinePriceSearch.com – They’ll do the comparison shopping for you. You’ll immediately see where you can get the best price. BestDealMagazines.com: Subscribe to their weekly email to be informed of their “Deal of the Day” specials. Most subscriptions are under $10. Email subscribers will receive frequent coupon code alerts. Now is a great time to buy these coupon-packed books. Most coupons in the book are valid through November 1 – still plenty of time to get more than your money’s worth. Here’s the “double your deal” secret: Begin at Ebates.com. Currently, Ebates.com is offering a 25% refund back to you, when you begin your purchase of an Entertainment Book at Ebates.com. For just $15, minus your 25% refund, Mom will enjoy “two-for-ones” all around town. Earn while You Shop n Surf: Be sure all of your internet searches begin at Swagbucks.com – earn Swagbucks towards gift certificates. While you’re searching, keep earning your way towards something for you! Give the Gift of Time: Create your own coupon book, with a “gift” for each month of this next year. Choose an activity or surprise for Mom that she can look forward to: tea with you, errands done, garden weeded, lunch and beach walk, etc. Special Gift Wrap: Utilize artwork the kids have made or brought home from school. Have them practice their letters, draw pictures of their family and pets, etc. Make a Memory: For Grandmothers or Mothers living miles away (or any Mom), film a greeting card. Include visits to your child’s class, storytelling, songs, bits of ballet practice, or sports practice. Decorate the DVD cover with your child’s artwork, and you have a treasured gift that will be viewed time and again. Be sure to include some sentimental aspects too, like a message from you about what makes your Mom special. Here are Today's TOP deals for moms. Deal OF The Day - Free kids workshop at Home Depot. May 1, 2010 the project is building a Picket Fence Planter. Click here for more details. Home Depot offers FREE Kids Workshops which are FREE " How To Workshops'" designed for children ages 5-12. The hands-on sessions are offered on the first Saturday of each month between 9:00am and noon at all Home Depot Stores. Saturday May 1st, 2010 LOWES is offering another fun FREEbie "Build and Grow Clinic". There is a simple 3 step sign-up process. You do need to do online prior to attending a clinic. Q : Who has the most neck bones? A human or a giraffe? A: They both have 7 vertebraes. Would you rather have a long neck or big ears? Q: I live in the ocean, I swim wherever I want, I sing to my family, I can breathe through a hole in the top of my head. Who am I ? Fasten your seatbelts and get set for a thrilling joyride with everyone’s favorite animated fix-it man, Handy Manny on Handy Manny: Big Race, the delightful new DVD release from Walt Disney Studios Home Entertainment available in stores April 20, 2010. Special guest stars, NASCAR champion Dale Earnhardt Jr. and actor/pop singer Lance Bass (‘N Sync) lend their voices to this captivating story that is sure to rev up both preschoolers and their parents. Start your engines and get ready for Manny (Wilmer Valderrama, That ‘70s Show) and Elliot (Lance Bass), who team up to build a fabulous race car to enter into the Wood Valley 500 race. However, with the pressure of the race approaching, Elliot decides he’s not quite ready to take the wheel and bows out. It’s up to Manny to put his driving skills to the test in an attempt to reach the checkered flag and win the race for the team! Big Race features a brand-new song with Wilmer Valderrama and the voice talent of special guest star Dale Earnhardt Jr.
A top 10 television series with preschoolers age 2-5, Handy Manny, is an Emmy-nominated show, set in a multicultural, multi-generational community and follows a curriculum that models problem solving and the importance of community. In addition to imparting life lessons about working together, communication and setting goals, the series also highlights some Spanish words and phrases, and exposes viewers to aspects of Latin culture. WIN: 24/7 MOMS and Walt Disney Studios Home Entertainment are giving away one Handy Manny: Big Race DVD. *We received a complimentary Handy Manny DVD for review no financial compensation was received. Q: What is the Capitol city of the state you live in ? Q: What goes round the house and in the house but never touches the house? MOM are you in need of a nite off, a nite out , a nite with your girl friends? May 6th is YOUR nite - "National MOMS Nite Out" will be celebrated all across the country and 24/7 MOMS is joining the celebration with TWO events. Looking for SIMPLE gifts to thank the Teachers in your child's life? We asked both our Twitter Followers and our Facebook friends to help us compile a list of their REAL mom ideas and together we created a list of 20 SIMPLE ideas to use now and the many years ahead. 1. Complimentary Note To Administration - Write a letter to the building principal stating the positive experience your child has had with that particular teacher during the school year. These are the things that become part of the teachers file and possibly even forwarded to the Superintendent's office. It's nice to be appreciated by the parents! 2. School Supply Gift Certificates - To a book store (chain or local); an educational book store or learning warehouse. Teachers spend a lot of their own money on classroom supplies so this will be a welcomed gift. 3. YUMMY Gift certificate - For coffee at Starbucks or your local coffee shop or their favorite place to eat. 4. Potted Plants - Purchase a pot that possibly the entire class can sign, decorate or place their hand print on or even make finger print lady bugs all over it. then pot a nice plant in it for her to enjoy. 5. Books - A book to be used in the classroom. Inscribed with a note from the child. A group idea would be to provide a bookshelf that the students all help paint and decorate then each can contribute a book to. If all of the kids participate this is only 1 or 2 dollars per child. You can also find gift certificates for magazines so the teacher can choose her own. 7. Board games - These are a great addition to the classroom and can be used year after year in the classroom -- Smath, Monopoly, Boggle, Scrabble, Pay Day, Jenga, Brain Quest, Manacala, Uno. 8. Hobbies - If you know that your teacher has a particular hobby or interest, gear the gift to that interest. 9. Group gift- Have all kids pitch in… to buy bigger gift. Do some investigating where does your teacher like to shop, eat out, type of entertainment such as theatre, movies etc. 10. Summer Theme Gift - ice cream scoop and hot fudge/ beach bag wit new beach towel. 11. Pamper Gift- a gift card/certificate for a manicure or pedicure at a local shop. Every teacher enjoys a bit of pampering to kick off the summer! or create a pamper me gift basket filled with polishes, socks, lotions etc. 12. Personalize Gift - for her life- beyond the classroom. Jewelry, a new shirt, item to ad to a collection she has etc. 13. Freezer Meals - Gift certificate to a local make ahead meals such as Dream Dinners. 14. Herb Garden - pots with herbs or a pot with basil , small bottle of balsamic vinegar, small bottle of olive oil, recipe card for tomato salad with basil. 15. Baked Pies - Bake a homemade pie or other baked goods. 16. Thinking Ahead - A new cute lunch tote, office/school supplies place in a basket . Investigate if she has things in her classroom that needs to be replaced or replenished. 17. Everyday Gift - Gift Certificate to local Target or Wal-Mart is EXTREMELY usable for both personal and their classroom. 18. Donation Gift - Donation to a cause of her interest. 19. CHOCOLATE - Do they have a favorite special chocolate they like Sees candy, Godiva etc. Treat them to 1lb of sweets. 20. Homemade - Cards and flowers picked from your garden are simple and almost FREE ..remember its the thought that counts not the amount of money we spend. EAT CLEANERTM consumer and commercial products are laboratory-tested and proven to remove up to 99.9% of pesticide residues, waxes and dirt that can carry bacteria from commercially and organically grown produce. EAT CLEANERTM also removes surface debris from seafood and poultry and effectively cleans food preparation and cutting surfaces to help deter cross contamination. Additionally, EAT CLEANERTM helps inhibit food browning while prolonging the shelf life of fresh produce. Effectively removes pesticides, waxes and dirt that can carry bacteria from commercially and organically grown produce. Also removes surface debris that can carry bacteria from seafood and poultry. Safely cleans countertops and cutting surfaces around uncooked produce, seafood and poultry. Does not alter the natural flavor and smell of foods and leaves no residue. Available in a ready-to-use spray and innovative wipes. Low-impact packaging featuring recyclable plastic bottles, compostable substrate and concentrate refills. Ready-to-Use Fruit + Vegetable Wash // Concentrate Fruit + Vegetable Wash Refill: Just spray and soak for 2 minutes, then rinse. Ready-to-Use Seafood + Poultry Wash // Concentrate Seafood + Poultry Wash Refill: Just spray and soak for 2 minutes, then rinse. Grab ‘n Go Fruit + Vegetable Wipes: Cleans the surface of fruit + vegetables without the need to rinse with water. Encourages healthy snacking on the go. Name 3 things Eat Cleaner removes from fresh food that water can’t. On average, how many sets of hands touch fresh produce before we eat it? Does organic produce need to be washed with Eat Cleaner and why? *We received a complimentary My Lunch Box for review no financial compensation was received.